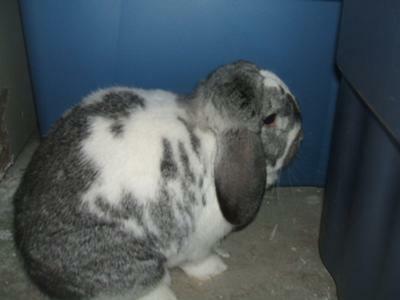 This is lettuce, my chubby mini lop. He is hiding among the Christmas decoration bin:). his favorite food is bananas and his favorite toy is a little wooden bunny brain teaser. I got him when he was still downy and fluffy. It gets pretty annoying when he chews on the phone cord, because we've already gone through 3 or 4! His little bro got mauled by a dog at under a year:( I think lettuce is lonely... He has a little bit of a temper and thumps for no apparent reason. About a year ago he had warbles so we had to take him to the vet. when he got back half his body was shaved. I couldn't help but laugh, but then he thumped at me. Today I put 2 mirrors in my room on the floor and apparently he was bothered by that. 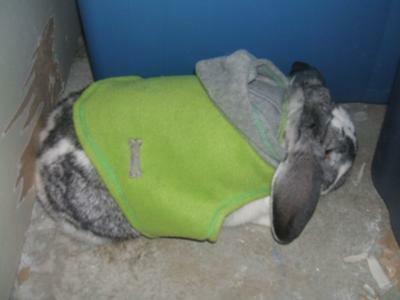 I bought him a little green hoodie a while ago so I am also posting that on him.